It was once considered a letter in the English language. The Chinese call it a little mouse, Danes & Swedes call it 'elephant's trunk', Germans a spider monkey, and Italians a snail. Israelis pronounce it 'strudels' and the Czechs say 'rollmops’. What is it? While in the English language, @ is now referred to as the "at sign," other countries have different names for the symbol (commonly associated with either food or animals – see list below for more names for the @ sign). 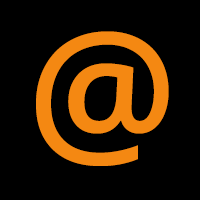 But by modern standards, the @ symbol is now commonly used and accepted around the world in e-mail transmissions/emails and Twitter handles. But today’s definition of @ wasn’t recognized until 1972, when Ray Tomlinson sent the first electronic message (e-mail) using the @ symbol to denote sending message from one location (computer) to another location (computer) -- user-name@name-of-the-computer. But before the @ sign became what we know it today, the sign has a long and ambiguous history. One theory states that medieval monks looking for shortcuts while copying manuscripts changed the Latin word for “toward” (ad) to “a” with the back part of the “d” as a tail to shorten the amount of pen strokes (resulting in the @ sign). Other linguists will argue that the @ symbol is a more recent development, appearing sometime in the 18th century as a symbol used in commerce to indicate price per unit, signifying “at the rate of.” For example, 10 pigs @ $1. In 2000, documents were discovered from the 14th century that showed the @ sign to indicate a measure of quantity. Afrikaans - In South Africa, it is called aapstert, meaning "moneky's tail"
The Arabic word for @ is fi, the Arabic translation of atBosnian, Croatian and Serbian - In these countries, it is referred to as the "Crazy I"
Czech - In the Czech Republic, it is called zavinac, meaning "rollmop," or "pickled herring"
Danish - It is called alfa-tegn, meaning "alpha-sign" or snabel-a, meaning "elephant's trunk" or grisehale, meaning "pig's tail"
Dutch - Since English is prominent in the Netherlands, the English "at" is commonly used. However, the Dutch also call it apestaart, meaning monkey's tail," apestaartje, meaning "little monkey's tail" or slingeraap, meaning "swinging monkey"
French - In France, it is called arobase the name of the symbol. It is also referred to as un a commercial, meaning "business a", a enroule, meaning "coiled a", and sometimes escargot, meaning "snail" or petit escargot, meaning "little snail"
German - In Germany, it is called Affenschwanz, meaning "monkey's tail" or Klammeraffe, meaning "hanging monkey"
Greek - In Greece, it is called papaki, meaning "little duck"
Hebrew - It is shablul or shablool, meaning "snail" or a shtrudl, meaning "strudel"
Hungarian - In Hungary, it is called a kukac, meaning "worm" or "maggot"
Italian - In Italy it is called chiocciola, meaning "snail" and a commerciale, meaning "business a"
Japanese - In Japan, it is called atto maaku, meaning "at mark"
Mandarin Chinese - In Taiwan it is called xiao lao-shu, meaning "little mouse," lao shu-hao, meaning "mouse sign," at-hao, meaning "at sign" or lao shu-hao, meaning "mouse sign"
Polish - In Poland, it is called malpa, meaning "monkey." It is also called kotek, meaning "little cat" and ucho s'wini, meaning "pig's ear"
Romanian - In Romania, it is called la, a direct translation of English "at"
Russian - Russians officially call it a kommercheskoe, meaning "commercial a", but it is usually called sobachka, meaning "little dog"
Swedish - The official term in Sweden is snabel-a, meaning "trunk-a," or "a with an elephant's trunk"
Thai - There is no official word for it in Thai, but it is often called ai tua yiukyiu, meaning "the wiggling worm-like character"
Turkish - In Turkey, most e-mailers call it kulak, meaning "ear"
The History of the @ Sign (June 24, 2010). Retrieved from http://www.webopedia.com/DidYouKnow/Internet/HistoryofAtSign.asp.